256 p., 14,7 x 20,8 cm. With contributions by Werner Bohleber, Friedrich-Wilhelm Eickhoff, Ernst Falzeder, Hanna Knapp, Heinz Müller-Pozzi, Carl Nedelmann, Rosine Jozef Perelberg, Gerhart Scheunert and Laurie Wilson. 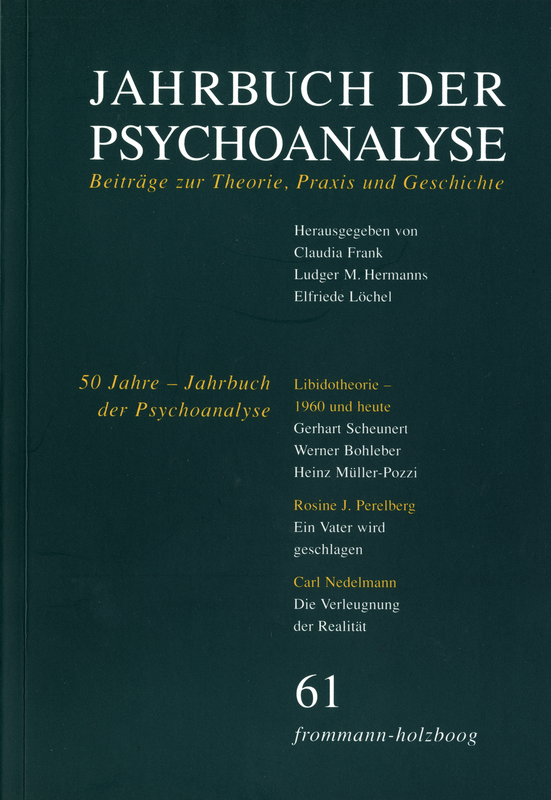 The ›Jahrbuch der Psychoanalyse‹ is celebrating its 50th anniversary, an occasion for retrospection and for moving forward as well. With this in mind, we are starting a new series with volume 61. An article from the early years, ›Entwicklung und Weiterentwicklung der Libidotheorie‹ (Development of the Libido Theory) by Gerhart Scheunert, one of the founders of the ›Jahrbuch‹, has been provided with new commentaries written by two outstanding representatives of differing psychoanalytic viewpoints from a present-day perspective, in this volume by Werner Bohleber and Heinz Müller-Pozzi. With the publication of last year’s Karl Abraham lecture by the English psychoanalyst Rosine Jozef Perelberg (›Ein Vater wird geschlagen‹) (A Father is Being Beaten) as well as the current Wolfgang Loch lecture by Carl Nedelmann (›Die Verleugnung der Realität‹) (The Denial of Reality), the study of perversion continues along with the tradition of documenting this lecture series in the ›Jahrbuch‹. The column on the ›History of Psychoanalysis‹ includes an article by Hanna Knapp on the early reception of psychoanalysis in Spain and an addendum by Ernst Falzeder on Freud’s analysis of Elfriede Hirschfeld. A detailed essay by F.-W. Eickhoff deals with the newly published complete edition of the correspondence between Freud and Karl Abraham. The author believes that a general theory of instinctual drives is a necessary basis for the psychoanalytical theory and can not be given up without eliminating the fundamental concept. The genetic understanding of normal and psychopathological phenomena would be impossible without it. The author therefore finds himself in a distinctly different position from the Neo-analytic, Cultural and other schools which disregard the need for a basic drive-theory. After a brief historical presentation of the development of concepts in Freud’s libidinal theory the author discusses some of the more recent interpretations. The work of Hartmann, Kris and Loewenstein concerning the problem theory of aggression is reported extensively. The author feels that the understanding of aggression – corresponding with libido – as a basic drive of the vital stratum (»Vitalschicht«) is the most apt concept. Referring to P. Federn’s and H. Hartmann’s assumption of a primary energy of the ego and relating to the concept of the surplus energy of the human being the author proposes to understand this primary energy of the ego as the basic energy of all psychic functioning. To this, libido and aggression – in their opposing tendencies – are added as energies which are not bound tonicly. The development and maturation of the human being is understood as a continuous process of transformation of libidinal and aggressive energy into neutralized energy, i. e. energy which is bound in the constantly differentiating evolution of personality. The fruitfulness of such a theoretical model should be proven by its usefulness in the explanation of clinical, psychological and physiological data. The return to the psychoanalysis of Sigmund Freud and its newer developments of psychoanalysis was a longer process of renewal for the DPV-group after 1950. The paper describes the changes taking place in German psychoanalysis in the period of the 1950ties and 1960ties. Cut off from the international developments a clinical and theoretical reorientation had been underway during times of the NS-regime. The so-called synoptic psychotherapy – grouping together the various schools in depth psychology – has evolved. Its programme was pursued and developed further after 1945, broadened and deepened by anthropological psychotherapeutic approaches. In a longer process of reception and transition these theoretical traditions were substituted by American ego-psychology standing in a radical opposition to them. Gerhart Scheunert played an outstanding role in the course of this development which is described in this paper. Starting from Gerhart Scheunert’s paper Development of the libidinal theory (1960) the author investigates into the fate of the libidinal theory. Ego psychology, attachment theory, self psychology and psychology of object relations, which were leading in the second half of the last century, dismissed the libidinal theory, i.e. the theory of infantile sexuality in its function of constituting the subject. Not so structural psychoanalysis. Jacques Lacan and Jean Laplanche built the libidinal theory on a new foundation. They show that and how desire and sexuality are grounded not on an organic, but on an intersubjective basis. The intersubjective perspective of French psychoanalysis demands the debate with the intersubjectivism of American origin as well as the relational psychoanalysis which reduce the role of sexuality to one motivational system among others. In this paper I have suggested that the phantasy »a father is being beaten« is an important organizer in the structuring of psychic life. It appears in the analyses of some men as a result of the analysis. This contrasts with the experience of some male patients who have actually beaten their fathers or have repetitive daydreams of beating other men. The phantasy »a father is being beaten« does not have to consciously involve the actual father; the father appears as a result of interpretative work. One is outlining a dynamically unconscious phantasy. I have discussed two examples, one of which was derived from my own clinical practice. I have suggested that another account encountered in the literature, that of Karl Abraham’s patient, presents a similar but also contrasting example. A childhood repetitive dream indicates a more persecutory phantasy, not yet elaborated in the same way as for my own patient. Freud’s myth, in which the father needs to be murdered in order to be erected as the third element, seems to me to be a mythical account of the process of growing up, where the parents need to be destroyed by the adolescent in order for him to grow and establish a solid sense of sexual identity (Perelberg 2009b). The elaboration of the Oedipus complex and the relinquishing of one’s incestuous phantasies place the individual in a temporal dimension. The object needs to be gained in order to be lost and then represented, as Freud indicates with the analysis of the »fort-da«-game. This requires facing the desire to kill the father, or » beat the father to death«, as has been possible in Mauro’s analysis. I have now encountered this phantasy of a »a father is being beaten« in several analyses of male patients (see also Perelberg 2007, 2009) and suggest that it is a crucial achievement in the analysis of many male patients. It initiates the process of mourning that allows them to initiate their experience of their own temporality and historicization. This article outlines the reception of psychoanalysis in Spain in the early decades of the twentieth century. Long before the establishment of psychoanalytical institutions, the theories of Freud had been enthusiastically received by artists and intellectuals. In addition, psychoanalysis became popular in an attempt to modernise contemporary Spanish intellectual culture. It was within this context that the philosopher Ortega y Gasset promoted the translation of the works of Freud, which have been published in Spanish since 1922. These theories were especially influential amongst the artists and writers residing at the Residencia de Estudiantes in Madrid during the 1920s, for example, Salvador Dali, Federico Garcia Lorca and Luis Bun˜uel. During this period, in the medical and psychiatric fields, the concepts and methods of psychoanalysis were often discussed and debated, some psychiatrists even attempted to implement these in their practice. However, the plans of the first Spanish psychoanalyst, Ángel Garma, to establish a psychoanalytic institute, were thwarted by the advent of the Spanish Civil War. In this paper I have proposed that Alberto Giacometti’s earliest remembered drawing contains the record of his need to transform a frightening visual experience of near death into art. In a similar manner his post-war style epitomizes the final transformation of that need into masterworks that stand as monuments to the world’s need to deal with the frightening sights of the war and Holocaust.